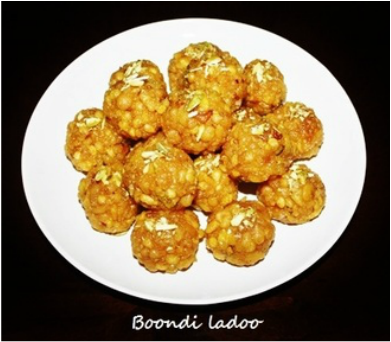 ﻿B﻿oondi ladoo is a well known Indian sweet often prepared for festivals and also to celebrate important events. 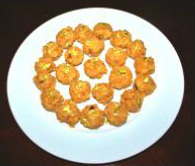 Ladoo’s are given as a prasad after puja and distributed as a sweet in weddings and other occasions. Boond means “drop” in Hindi and Boondi looks like a drop. These drops (Boondi) are made from gram flour (Besan). 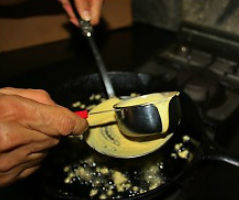 Gram flour batter is slowly poured into hot oil through a perforated spoon. 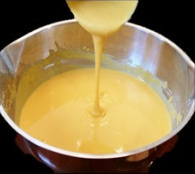 This batter will then drop into the pan in the form of small circular droplets, after frying them they are soaked in sugar syrup. Once they are soaked ladoo’s are made or they are eaten as sweet boondi. It seems difficult to make boondi ladoo but they are fairly simple to prepare. 1. 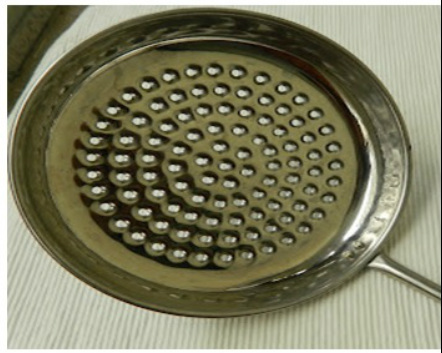 In a sauce pan add sugar and water and boil on medium heat for 10 to 15 minutes or until water evaporate to half and syrup become thick to one thread consistency or syrup temperature reach to 220 degree. You can check single string, by swiping little syrup on your index finger, rub it on thumb and slowly stretch, when you get single string consistency switch the flame on to very low so that syrup does not become thick. 2. Add crushed cardamom seeds, saffron and few drops of yellow color and mix, keep it aside. 1. 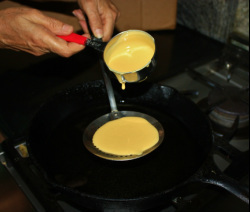 In a bowl add besan (gram flour) and add little water at a time and mix to make a smooth pancake like batter or slightly thicker than dosa batter. 2. Heat oil in a wide pan, so that the frequency of making boondis will become less and make more boondi's in every single batch. For first 5 minutes turn the heat high, once oil heats up turn the heat down to medium. 3. 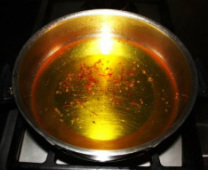 When oil start smoking that means it is hot enough, to test drop a small drop of batter in the hot oil, if it start sizzling and comes up it means it is the right heat but if it become too dark quickly it means oil is too hot, turn the heat down. 4. Before you start making boondi check the consistency of batter by pouring a little batter over spatula and see if the boondi’s are easily falling out or not. If the batter does not drop right away through the holes it means it is too thick then add some water in the batter, if you have more water than boondi will go flat and form like a lump then add some besan. Batter should be like dosa consistency. 5. 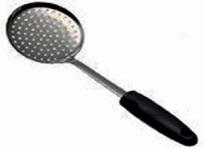 Now take a perforated spoon and hold in your left hand about 1½ “above the hot oil, with the right hand fill a ladle with the besan mixture and pour over the perforated spoon without spilling over the edge of the spoon, shake or tap the edge of the spoon or with the back of the ladle spread the batter all around like you make dosa, batter will start falling in very fine drops into the oil and sets into boondi. If you do not tab or shake the batter will fall on one place into the pan. 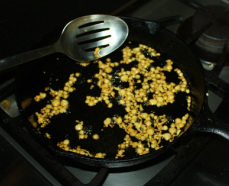 Drop enough boondi into the oil so they just cover the surface of the oil in frying pan in a single layer. Do not over crowd the oil. 6. 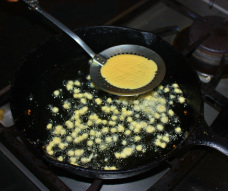 As soon you drop boondi in the oil, it will vigorously bubble, with another spatula stir the boondis and when the bubbles stops, remove them immediately or until boondis are light gold in color. It takes about a minute to fry the boondis. They should fry but not crispy this will make them soak better in syrup. 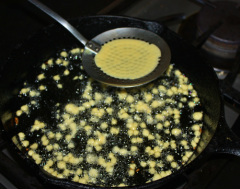 Take the boondi out of the oil and place them over paper towel so that extra oil observed by paper towel. 7. Turn down the heat to low. Before you fry another batch each time wash the spoon and wipe clean with a kitchen towel nicely so that holes do not become clogged otherwise boondi will not fall. Drop the boondis and raise the heat to low medium. 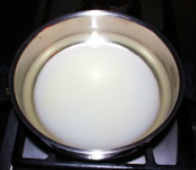 Repeat the process of making boondi with rest of the batter. 8. 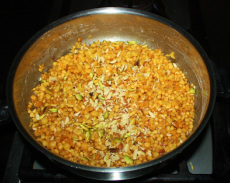 Add the fried boondi and sliced almonds and pistachios in the warm syrup and mix and leave it for an hour. 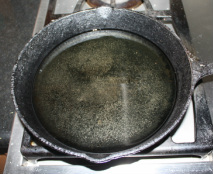 To keep the syrup warm keep the pan on the stove on very low heat. 9. 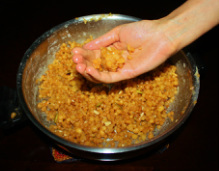 Once boondis are soaked and they are still warm take some boondi in your palm and make a tight fist so that the boondis hold together then by squeezing them make a round ball. You can make boondi ladoo larger or smaller as your preference. Then place them in a plate. 10. Allow the ladoos to cool to room temperature before serving. an airtight container for about a week. holes for dropping the boondis in the oil. the sugar will crystallize. Then add little water and heat on low for few minutes. minute boondi will become soft and will be easier to make ladoos. 6. 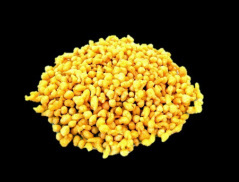 To make perfect Boondi you need Boondi jhara but it is not easily available. 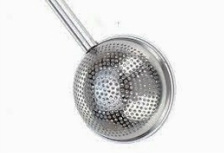 You can use regular spatula with holes for dropping the boondis in the oil. discard them just break the big pieces and if the tail is big break it. should cook and come up separately.